After the marriage of the Pandavas, Vidura went to Pancala and told them, Bhisma, Drona, King Dhritarashtra and Queen Gandhari, all want them to return to Hastinapur." 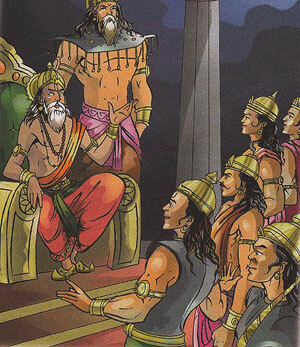 But the Pandavas were not sure if they would be safe near Duryodhana. Krishna advised Vidura to divide Hastinapur between the Kauravas and Pandavas to ensure peace. The Pandavas went to Hastinapur and were given a warm welcome. Dhritarashtra told Yudhisthira, "The throne of Hastinapur belongs to you. But when your father Pandu died, you were very young so I was made king. Due to this, Duryodhana wants to be king. So everybody has decided to give you half the kingdom." Yudhisthira agreed and became the ruler of half the kingdom with its capital in Indraprastha.